Ask five people to perform an exercise and you’ll probably see that exercise performed five different ways! Some technique variations are down to biomechanical variations such as height and limb length. But others are down to lack of knowledge of correct exercise form or trying to lift too much weight, do too many reps or exercise too hard. Focus on form first, not weight or reps.
[quote_right]Focus on form first, not reps or weight[/quote_right]Individual variations due to biomechanical variations are, providing they are safe, quite acceptable. But true “bad form” is not and can create several problems. 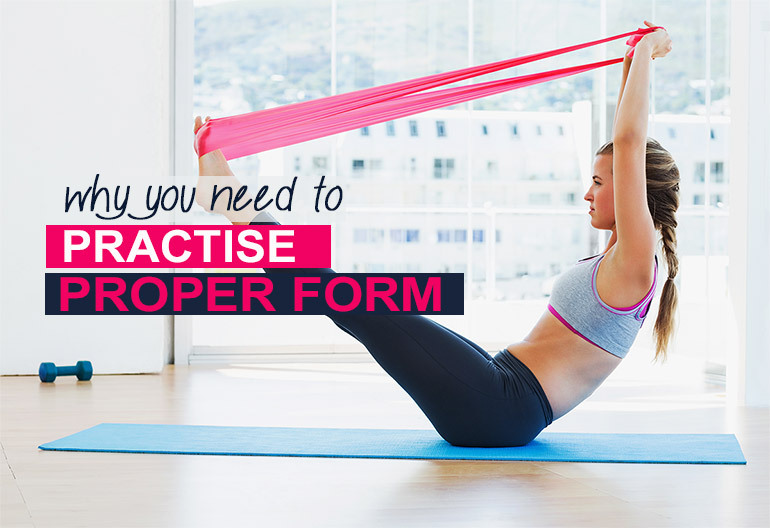 Here’s why you should practice proper form. Exercises are designed to work your body in a specific way. For example, the aim of the biceps curl is to “stress” (i.e. work) your biceps. However, performing exercises with bad form puts stress onto other parts of the body and takes stress off the muscles it should be targeting. This results in a less effective workout. And often that’s due to performing too many reps or lifting too much weight. For example, if you can barbell biceps curl 40-lbs with proper form, your biceps are exposed to 40-lbs worth of tension, which will make them stronger and better developed. However, if you try to lift too much, and curl say 50-lbs, you’ll swing, jerk and wrench the weight up using poor form, causing your biceps to get considerably less stimulation, while your legs and back get plenty of work. This makes the exercise significantly less effective and also increases the likelihood of injury. Which brings up the next problem. A key reason to practice good form is to prevent injuries. Bouncing into squats, yanking on your neck to do sit-ups or using momentum might help you to do a few more reps or lift more weight, but your risk of injury is greatly increased. Bad form can cause both acute and chronic injury. And while your body may well survive a bit of bad form for a while, at some point, it will result in injury. Chronic injury can come about when, after a time, your body becomes slightly misaligned from repeatedly practicing poor form. This in turn can put your joints, muscles and tendons in positions that are uncomfortable and that could possibly result in strains or tears. Basically in making your muscles “strong” in the wrong way, you’re actually making your body weaker and vulnerable. It’s best to ease up on the weight or reps if it means you are better able to maintain proper form. If you’re learning a new strength training routine, it’s worth starting with little to no weight, until you get your form right. If your form breaks down during exercise, and you start doing things such as reducing your range of movement, speeding up or using momentum, there is no real way to accurately monitor fitness improvements. If you change the variables of an exercise, it makes it impossible to say whether you have got stronger. Changing the exercise means that you’re basically performing two different exercises, making it impossible to compare. To make sure that you’re keeping true and fair track of your progress, perform exercises using identical and correct form. Proper form isn’t talked about much, but in practicing poor form, you’re basically cheating yourself – even if it is unintentional. Poor form is like cutting corners in a race; of course you’ll take less time but only because you are running a shorter distance – not because you ran faster, got better or stronger.